Heat chicken tenders as directed on package using microwave. Meanwhile, in medium bowl, combine salad greens, onion, peanuts and 1/2 cup of the chow mein noodles. Cut each chicken tender in half; add to salad. Add salad dressing; toss to coat. Sprinkle with remaining 1/4 cup chow mein noodles. Fried cellophane noodles or sesame sticks can be used in place of the noodles. French dressing can be substituted for oriental salad dressing. 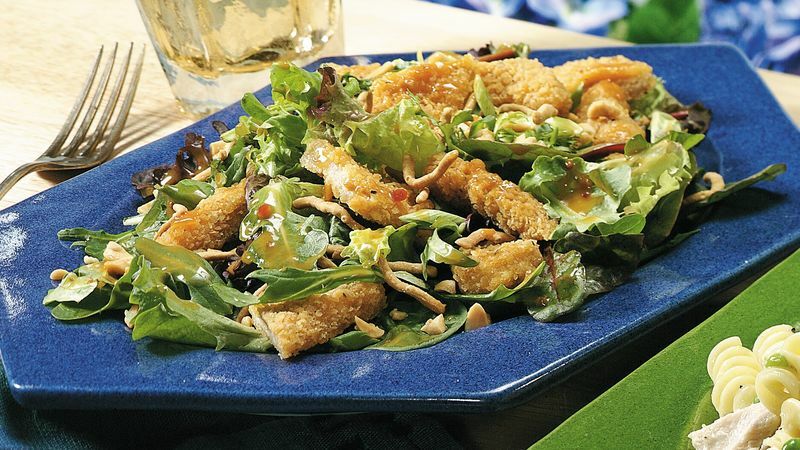 Breaded chicken tenders, chow mein noodles, peanuts - kids recognize the fun ingredients in this salad. It's a good recipe that demonstrates how a combination of foods they like can make a nutritious supper. Introduce a new vegetable with the addition of blanched snow peas, halved. For fun, eat the salad with chopsticks.